May 16, 2011, 11:30 a.m.
By Justin Ellis @JustinNXT May 16, 2011, 11:30 a.m.
It’s not that hard to find similarities between baseball and the newspaper industry. On one side you’ve got the New York Yankees: big payroll, extensive resources, and a renowned line-up. On the other you’ve got teams like the Kansas City Royals, who have, well, significantly less in terms. In newspapers its pretty similar: There’s The New York Times…and there’s The Augusta Chronicle or The Tulsa World, who have to be creative and scrappy in order to keep publishing. What we’re talking about, in a sense, is Moneyball for small- and medium-size market newspapers, and increasingly these newspapers are turning to online subscription models. They may be similar in some ways to those at papers like the Times, but less is known about their plans or how they’re faring. Now, however, we’ve got some numbers: In a recent study of small and mid-sized newspapers, 46 percent of newspapers with circulation under 25,000 say they are already charging for some online content, compared with only 24 percent of papers with a 25,000+ circ. And of the papers surveyed that don’t charge for content, only 15 percent said they have no future plans for a pay model. The findings were presented at the Reynolds Journalism Institute at the University of Missouri as part of RJInnovation Week, a series of presentations and discussions on paid content and new business models. The survey was a random sample of the nearly 1,400 daily newspapers in the US, of which most who responded — 77 percent — had circulation under 25,000. One third of publishers said paid subscriptions could account for as much as 20 percent of their digital revenue, while almost 50 percent thought an online pay model wouldn’t have much of an impact. While those numbers aren’t outright optimistic for the future, they may be more realistic, and reflect a pragmatism that separates small and mid-size papers from larger ones. For these papers, the margin for success is significantly different than their larger counterparts, but the stakes are just as high, if not higher. One common theme for these papers: The print product pays the bills. And what pays gets protected first. The Tribune began charging for online access on Dec. 1 using a metered model that allows users 10 free stories a month. From there readers have a variety of options, including an online-only subscription for $8 a month and 7-day delivery (plus total access to Columbiatribune.com) for $13.97 a month. But here’s the catch: Readers also have the option of a print-only plan at $12.97 a month (or $10.11/month for weekends plus Wednesday). If the Internet’s not your thing, you have the option (and maybe the incentive) to forgo online access. And for home subscribers who want online access? They have to pay a little extra. “I’ve said all along, if we didn’t sell one (online) subscription it would be a successful program because we stopped encouraging people from dumping us in print,” Waters said. One of the early tests for all paywalls is their impact on site traffic, and with smaller papers, again, we’re confronted by the differences in scale. Unlike The New York Times, which courts a national and international audience, smaller papers rely on traffic that — barring big scoops, the occasional Fark/Drudge pick-up, and local stories that draw national attention — is largely regional. That may be why, in the RJI study, a majority of publishers said a paywall would reduce pageviews by only 20 percent, or have no effect at all. And, again, more than 50 percent also said they didn’t expect a paywall to have impact circulation. 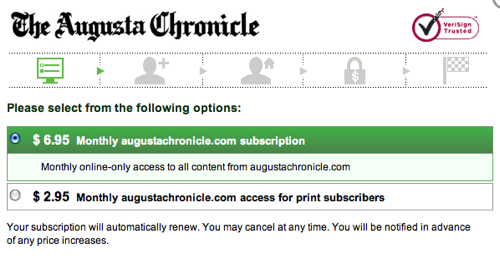 At The Augusta Chronicle, which was also early to implement a metered model, pageviews have been increasing, said Alan English, executive editor of The Chronicle. In January 2011, the first month after the paper’s online subscription model went into effect, pageviews increased 2 percent from the previous year. In March that jumped to 11 percent. What may have helped The Chronicle’s effort was the elastic nature of its paywall (it uses Journalism Online’s Press+): The paper initially offered 100 free stories, and has now dropped that number to 20. English said that flexibility had the effect of conditioning readers to the new system while slowly weaning them from the idea of completely free content. Much like the Columbia Daily Tribune, The Chronicle (around 60,000 circulation) also charges print subscribers for online access, adding $2.95 a month to their tab for digital reading. (It’s $6.95 a month for online-only access.) Ultimately, “we’re making a statement about the content having value and offering more services that have costs associated” with them, English said. Though the pay scheme saw pushback from some readers, English said The Chronicle wanted to make it clear that all the work it produces has value, whether in print, online, or on their iPad app (which is free for the moment). In rolling out the new subscription models, their pitch, via a marketing campaign, was basically “would you pay the cost of a cup of coffee for a city hall reporter”? English said offering that equivalent and implying a bond between readers and the newspaper helped convert some readers. But another factor, one that connects the Tribune, Chronicle, and World, is family ownership. The World has been owned by the Lorton family since 1917; the Tribune has been owned by the Waters family since the 1930s; and the Chronicle is owned by the Morris family. That type of ownership, Collington said, allows for flexibility and a quicker response to changes throughout the newspaper industry. POSTED May 16, 2011, 11:30 a.m.
Ellis, Justin. "Moneyball and paywalls: Lessons on paid content from smaller papers." Nieman Journalism Lab. Nieman Foundation for Journalism at Harvard, 16 May. 2011. Web. 18 Apr. 2019. Ellis, Justin. "Moneyball and paywalls: Lessons on paid content from smaller papers." Nieman Journalism Lab. Last modified May 16, 2011. Accessed April 18, 2019. https://www.niemanlab.org/2011/05/moneyball-and-paywalls-lessons-on-paid-content-from-smaller-papers/.